Often overlooked, kitchen taps are a vastly important part of our daily lives; and are one of the most-used items in the household. 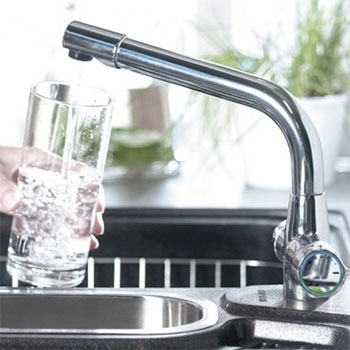 We offer a large selection of taps to cater for any household, commercial or industrial need and our range includes the extremely popular kitchen taps with pull out spray nozzles and boiling hot water taps. Whatever your requirement or budget, our expertly chosen selection has something for everyone thanks to our close relationships with some of the biggest brands in the business, like Grohe and Bristan. The general style of the piece. Usually categorised as Modern for contemporary pieces, Designer for high-end models, and Traditional for items bearing classical hallmarks. Refers to how an item can be installed. For example, a wall, floor or ceiling. An essential part of any home, the kitchen tap is a vital but often overlooked part of kitchen design. Browse through our extensive range of kitchen taps which will suit all budgets and style preferences, from ultra-modern to country cottage traditional. As well as standard taps for kitchens and utility rooms, our range also contains innovative products such as pull-out nozzles or taps which produce hot water on demand. Our expert team has worked long and hard to select our comprehensive range of taps, and you'll find all of the big brand names such as Bristan, Prestige, Ultra and RAK Ceramics, along with many more. Whatever your requirements for your new kitchen tap, you're guaranteed to find the perfect product here, all at great value for money prices. Hugely practical, kitchen mixer taps combine both hot and cold water in one flow from the tap, giving you water at the perfect temperature at the touch of a handle. Mixer taps cover all styles from very contemporary with modern square lines to traditional mixer taps which are the perfect accessory for the country kitchen look. Our huge range of kitchen mixer taps ensures there is the ideal tap for every home. Whether you are looking for one of the big brand names, or a more individual type of mixer tap, browse through our products for one of the best selections anywhere. All products have been selected to offer superb value for money, and with ease of installation and many of the taps coming with lengthy guarantees, these taps will keep your kitchen looking fabulous for years. Just like the high-powered taps you'd find in any professional kitchen, a pull-out tap will transform the way you use the sink area in the kitchen. Pull out taps feature a nozzle and hose which can be pulled free of the main structure of the tap, allowing you to easily rinse down surfaces or clean food and utensils. When not pulled out, the kitchen tap functions in the same way as any other kitchen tap. These hugely practical additions to any kitchen don't have to carry a designer price tag, and our pull out taps offer great value for money. As well as making a valuable accessory for any kitchen, this style of tap is also useful in utility rooms, and the shiny chrome finish will instantly make your home appear brighter and more modern. Sink tap pairs are a style of tap we're all familiar with; a separate hot and cold tap, matching in style and mounted on the kitchen sink. It's a classic choice which has stood the test of time for a reason - kitchen sink tap pairs are very practical and easy to use. A classic choice doesn't have to mean old fashioned though, as is demonstrated with the cutting edge design on some of the taps we stock. Simple to install and offering a range of operation movements from levers to traditional twist handles, our wide range of kitchen tap pairs ensures we have the perfect product whatever your kitchen style and budget. Take a look through our extensive range of kitchen sink tap pairs if you're thinking about transforming not just your sink, but your whole kitchen. No longer purely the preserve of professional kitchens, the instant hot water tap allows you to ditch the kettle and have access to instant hot water any time at the touch of a button. Whether you're making a cup of tea or washing up the pots and pans, wouldn't it be convenient to have instant hot water? Using a tank concealed under your kitchen units. The hot water tap itself is just as stylish and modern looking as any other type of tap, and can also be retro-fitted to many types of sinks. This type of tap will give the instant designer feel to your kitchen but doesn't come with the associated designer price tag. Browse through our range of instant hot water taps, consider how to integrate one into your kitchen at home and finally get rid of that kettle.